Buy Carnegie 8 Loop Resistance Band Fitness Band Gym Band Tubing Bodytrainer Resistance Expander from Carnegie Fitness at Camping Outdoor online. Resistance band, resistance tube, fitness tube, fitness tube, training band, Pilates ring or yoga band - these are many different terms that basically always describe the same thing. An expander. 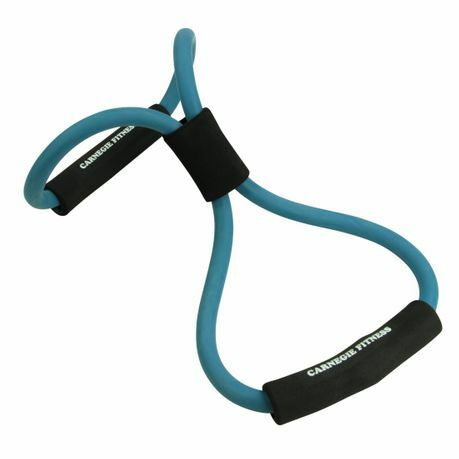 This 8-band expander from Carnegie is often used as a resistance band for various exercises in yoga, pilates or various fitness exercises at home or in the gym. It offers almost infinite training possibilities for the upper body, abdomen, legs, back, arms and many other muscle groups. Whether stretching, building up strength, lifting or reducing weight - you can train all body groups using different training methods. Our Resistance Tubes are made of natural latex. They are skin-friendly, odourless and free of harmful substances of any kind. The set is high-quality, durable and safe. Pure joy in training. Thanks to the free-turning foam rubber grips, the expander offers excellent grip and ensures that you won´t slip off so easily even with sweaty hands. Thanks to its compact dimensions and low weight, the Fitness Tube is easy to take with you anywhere, so you can decide for yourself where you want to train. Our resistance tubes are made of natural latex. They are skin-friendly, odourless and free of harmful substances of any kind. The set is high-quality, durable and safe. The Expander Ring has been fitted with free-turning foam rubber grips to provide excellent grip and comfort during training. Finite training possibilities. Upper body, abdomen, legs, back, arms. Whether stretching, building up strength, lifting or reducing weight - you can train all body groups using different training methods.